Description: A shimmering evocation, by turns intimate and panoramic, of one of the world’s great cities, by its foremost writer. Orhan Pamuk was born in Istanbul and still lives in the family apartment building where his mother first held him in her arms. 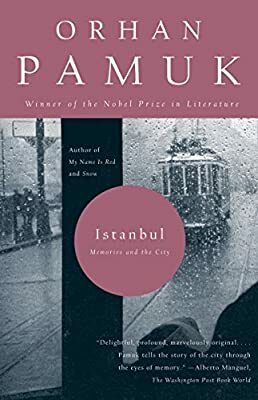 His portrait of his city is thus also a self-portrait, refracted by memory and the melancholy–or hüzün– that all Istanbullus share: the sadness that comes of living amid the ruins of a lost empire.With cinematic fluidity, Pamuk moves from his glamorous, unhappy parents to the gorgeous, decrepit mansions overlooking the Bosphorus; from the dawning of his self-consciousness to the writers and painters–both Turkish and foreign–who would shape his consciousness of his city. Like Joyce’s Dublin and Borges’ Buenos Aires, Pamuk’s Istanbul is a triumphant encounter of place and sensibility, beautifully written and immensely moving.